The tower of the main gate aroses out of a middle ages and subsequently have restored during the Fifteenth Century and became the home of the Lord of the castle with his Gunners. In the same time have built the Guard in the tower with the prisons with bars of a grating. 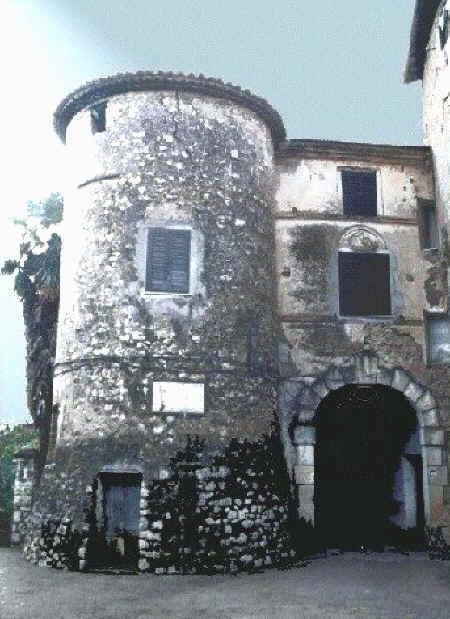 The tower was populary called of "King Metabus" because of an old inscription that a man of Letters of Villa Santo Stefano erected in the Nineteenth Century in commemorationof Virgilio’s event where told about Metabus, the king of Volsci and his daughter Camilla. In the Twenties the tower was more high from now even if in ruins, in his middle window can recognize a profile of a double lancet window and below the loop-holes for the harquebuses against banditry. From this mitic tower begins the old wall of the town that skirts the down-town until the secondary door called "the Portella".